Pentecostalism preaches a seductive message to the marginalized: that prayer, not political action, is the solution to their earthly woes. So says Bishop Formigioni. He has come far, flying from São Paulo to minister a service of four thousand followers at a Pentecostal church in North London. His ecstatic sermon rises from didactic preaching to hands-on healing. Then he brings the congregation to a climax. Silence, he tells them. Someone begins to wail, and the crowd soon becomes a writhing sea of bodies. The “possessed” have begun to “manifest.” Slickly uniformed church assistants pace the aisles and deliver people from evil spirits, laying hands on their heads and wrestling their bodies to the floor. Pentecostalism is one of the world’s fastest growing religious movements. In 2011 an estimated 279 million people counted themselves among the Pentecostal faithful; by the end of the decade, the Center for the Study of Global Christianity projects that number will rise to 800 million. Where northern missionaries once transported Christianity south and east, modern-day Pentecostals reverse this trajectory. Newcomers from Latin America and West Africa bring their faith to western cities, confronting new demons in the storefront churches and run-down urban landscapes where the spirits flow. Formigioni’s congregation belongs to the Universal Church of the Kingdom of God (UCKG), a Brazilian church that boasts millions of followers across 134 countries. Some have likened this global ministry to a spiritual scam or pyramid scheme that collects financial tithes from its congregations in exchange for ecumenical promises of prosperity. But there is more to Pentecostalism than profit-seeking. After folding banknotes into tithing envelopes, congregants at Formigioni’s service give testimonials detailing their financial hardships. Their prosperity seems perpetually deferred. So what keeps them coming back? The answer lies in the religion’s “spiritual warfare,” which casts material problems in the language of religious combat. It tells people their faith is a panacea to injustice — an alluring message for those tired of the empty promises of politics. Like an airport lounge or a shopping mall, Formigioni’s North London church isn’t designed to reflect its surroundings. Each UCKG location looks the same: a seven-stemmed menorah, an altar, and illuminated words above the stage proclaiming “Jesus Christo e o Senhor.” All follow a homogenous schedule of services designed to address practical concerns — money, health, family, career — with spiritual healing. When Formigioni joined the church as a recovering drug addict, he enlisted in a war with the Manichean spirits that both cause and cure such maladies. Now that he’s a pastor, he teaches his congregants how to wage their own battles. On Fridays, the congregation wears camouflage. Glossy church pamphlets advertise the services: Front line: roll up your sleeves and learn how to fight. One Friday morning, I took a thirty-minute subway ride to the church for the 10 o’clock service (one of four each Friday). The entrance was quiet, and the only sound came from the fountain, an elaborate hexagon at the center of the dark, polished foyer. Before long I found one of the many church assistants, who directed me to the thickly carpeted stairs that lead to a chapel normally reserved for Portuguese- and Spanish-language services. Upstairs, assistants held congregants’ foreheads and cursed the spirits at the root of their worldly problems. As Daniela promised, the pastor here prayed “strong,” bracing a man’s body so it bent forward like a tabletop and demanding that the spirit inside him leave. Spiritual warfare projects a biblical battle between demonic and divine forces onto human experience, giving believers a militarized vocabulary to explain complex issues. Often, these issues are deeply political. Yet the ritual does not distinguish between religious practice and structural problems. It sees societal change as an outgrowth of faithfulness rather than political action. The attractiveness of this cosmology lies in its seductive promise: that demons — not politics — are to blame for the world’s troubles. And that they can be vanquished through prayer. On the outskirts of Lagos, Nigeria, a one-kilometer-long aircraft hangar houses Redemption Camp, the flagship of the Redeemed Christian Church of God, a global Pentecostal ministry that started in Nigeria and now has branches across the world. Some call it Redemption City; pilgrims flock here in droves. Adedamola Osinulu, a professor at New York University and an expert on global Pentecostalism, explains the significance of Redemption Camp: it offers, he says, a spiritual alternative — a place where the politically disenfranchised can make their voices heard. Pentecostalism in Nigeria took off in the mid-nineties, when the brutal dictatorship of Sani Abacha meant “there was no political space in which to be active.” In that repressive environment, followers embraced religious ritual to express opposition without risking suppression or death. In many other developing countries, Pentecostalism revived in the 1980s against the backdrop of structural adjustment policies and deepening privatization. Scholars affixed the prefix “neo” to it, creating an apt connection between the religious movement and neoliberal economics. Of course, the depoliticization that marks Pentecostalism is just one religious response to political dispossession and economic marginalization. At its height in the 1960s and ’70s, followers of liberation theology insisted that the Catholic Church had to do more than just welcome the poor or offer faith as a personal balm. Describing the world in terms of “structural sin,” they saw religion as an instrument for tackling inequality and other social injustices. In countries across Latin America, liberation theology turned churches into a vital bulwark against dictatorship and oppression. The sermons highlighted the institutional power that Pentecostal churches can wield. But Brazil is the outlier, and the UCKG’s forays into electoral politics are more a reflection of the ambitions of its leadership than anything else. The vast majority of the time, there’s politics, and there’s Pentecostalism — and never the twain shall meet. As the scholar Martin Lindhardt notes, the theological separation between “this” world and the Pentecostal world of religious ritual means political events are seen as irrelevant to what really matters: spiritual action. 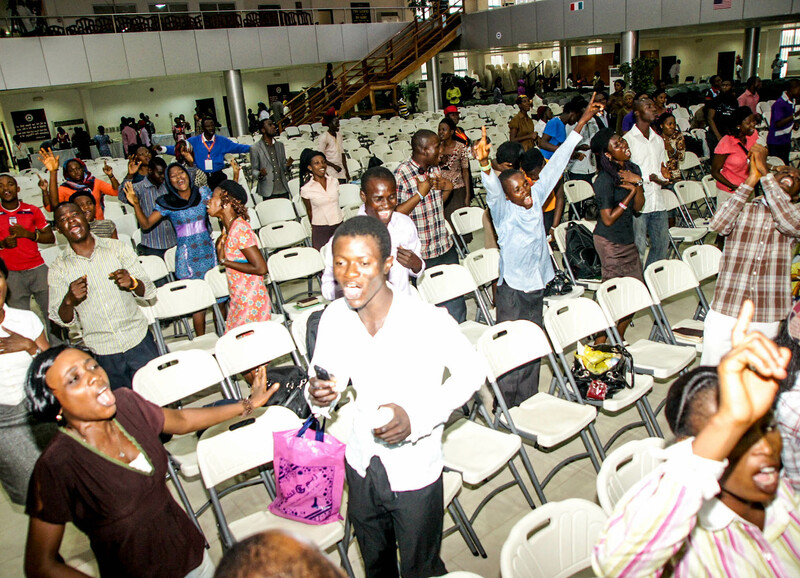 Worshipers at Redemption Camp, Osinulu says, are “not trying to change society or create an alternative.” Likewise for the clergy at UCKG in London. Pastor Fernando, one of the younger pastors, tells congregants that “justice” is not “out there,” where people are striking or “holding up signs,” but in their hearts, where they solidify their relationship with God. In places where rudimentary political action can carry enormous risk and economic forces batter workers and the poor, changing the world by changing yourself can be a compelling alternative. After all, why would you waste your time fighting hostile structures of power when you can attain the rewards of the spirit in the here and now? Pentecostalism grows in the fault lines of late capitalism, where structural injustices are psychologized and individualized. To hear Daniela tell it, people are poor because they’re “letting in the devil.” The path to prosperity is through enlisting in God’s army of spiritual warriors, who are faithful enough to resist these demonic forces. Like similar apologias — the myth of meritocracy comes to mind — spiritual warfare obscures the root of the problem: people are poor in the advanced capitalist world because money has been redistributed upward. Concentrated wealth, not insufficient faith, explains the dire economic straits in which many Pentecostal congregants find themselves. As anthropologist Kevin O’Neill puts it, spiritual warfare allows “complex problems with deep historical roots to be moralized — to be defined as matters of character, individual failing, or sin.” In doing so, it misdirects congregants, channeling their energy toward individual struggles for recognition and redemption and away from collective struggles for redistribution and emancipation. This isn’t to say Pentecostalism doesn’t benefit some of its congregants. People at the UCKG eagerly insist on their faith’s transformative power, and many maintain that it’s allowed them to climb from the lowest rungs of the social ladder to wealth and civic engagement. They tell stories of tackling drugs, truancy, and poverty. For women dealing with domestic violence and machismo culture, the churches can cultivate important leadership and social skills. At the very least, Pentecostalism can make crushing problems — poverty, political marginalization — seem more manageable. Yet the belief that individual empowerment can remedy structural issues inevitably redounds to the benefit of capital — the very force responsible for their marginalization. Scholars have long pointed out that the neoliberal state pathologizes the most marginalized — castigating them as “welfare queens” (in the US) or benefit scroungers (in the UK) — and cuts state services while speaking the language of empowerment. David Cameron’s Big Society exemplified this combination: he argued that if society could take charge of its own issues, the state would become less cumbersome, no longer weighed down by unnecessary interventions. In reality, the “Big Society” was Thatcherism by a different name: austerity and privatization policies simply shifted responsibility for providing vital benefits from the state to the individual and civil society. Christian organizations once had soup kitchens; in Britain they now ran food banks. Pentecostal churches were among those that stepped in as the state pulled back. At the UCKG, congregants jostle to have their CVs blessed by pastors and get help navigating the bureaucratic frustrations of Home Office paperwork. Cameron himself seemed to see the connection: on the campaign trail in 2015, he visited the Redeemed Christian Church of God, where he evangelized visions of his Big Society and preached the importance of aspiration. In countries such as Nigeria, where governments implemented neoliberal policies under pressure from international institutions, Pentecostal churches played a similar role. But whether in Nigeria or Britain, genuine empowerment was nowhere to be found. This was nothing more than a faith-inflected shell game. Capitalism and religion have long been intertwined. In 1905, Max Weber argued that the “spirit of capitalism” was grounded in a “Protestant ethic” — a Calvinist proclivity for reaping the benefits of hard labor. Perhaps Pentecostalism has flourished because it jives with the spirit of late capitalism, a system that justifies deep structural injustices with the rhetoric of empowerment, innovation, and individual responsibility. Regardless, the massive growth of Pentecostalism shows that capitalism and urbanization do not automatically breed secularity. In his 1965 book The Secular City, Harvard theologian Harvey Cox predicted a “post-religious” age. After studying the Pentecostal movement, he retracted his claim. “Today it is secularity, not spirituality, that may be headed for extinction,” Cox later wrote. That claim is likely overblown. But contrary to the expectations of previous generations, who saw modernity as religion’s death knell, faith is here to stay. The only question is in what form. Hettie O'Brien writes about political economies and is a graduate student at the University of Cambridge.